As you drive up the coast of California from Los Angeles, you pass through the city of Santa Barbara. The 101 Freeway starts to shift from a Western direction to a Northern direction. An hour past Santa Barbara you arrive in Santa Maria, located in the northernmost region of Santa Barbara County. What makes Santa Maria so unique is that it is the largest East-West running coastal valley in California. With the ocean just seventeen miles from the mid-valley, the winds are cool. These transverse mountain ranges funnel the cool wind between the San Rafael Mountains to the north and the Solomon Hills to the south. There is nothing to shelter the vineyards from the wind, resulting in a fog that blankets the region for two-thirds of the day during the growing season. When the fog burns off in the afternoon, it is bright and sunny with daytime highs of 75 degrees in the warmest months (August – October). These cool temperatures result in a long growing season with early bud break and a long hang time. Santa Maria is a tale of two sides of a valley, separated by a river in the middle, with a bench and foothills on both sides. The vineyards in the Santa Maria Valley are planted on elevated plateaus along the Santa Maria River. The base material for the soil comes from the river, along with shale and other ancient material. Formed during the Ice Age, when the sea receded, it left an expanse of sand and shells. The wind came in, blowing in more debris. Rocks washed down from the mountains and small rocks remain from the ancient sea floor. Santa Maria is an area primarily dedicated to Chardonnay and Pinot Noir, as well as cool-climate Syrah. With famous vineyards like Bien Nacido Vineyards (named one of the Top Ten Vineyards in the World by Wine and Spirits Magazine), Solomon Hills, Julia’s Vineyard, Rancho Ontiveros and the Foxen Estate Vineyard, the area produces wines with acid and tension but also great fruit. While there are many winemakers buying fruit from Santa Maria vineyards to make wine, there are almost a dozen wineries with tasting rooms in the region where you can get to know the wines and region better. 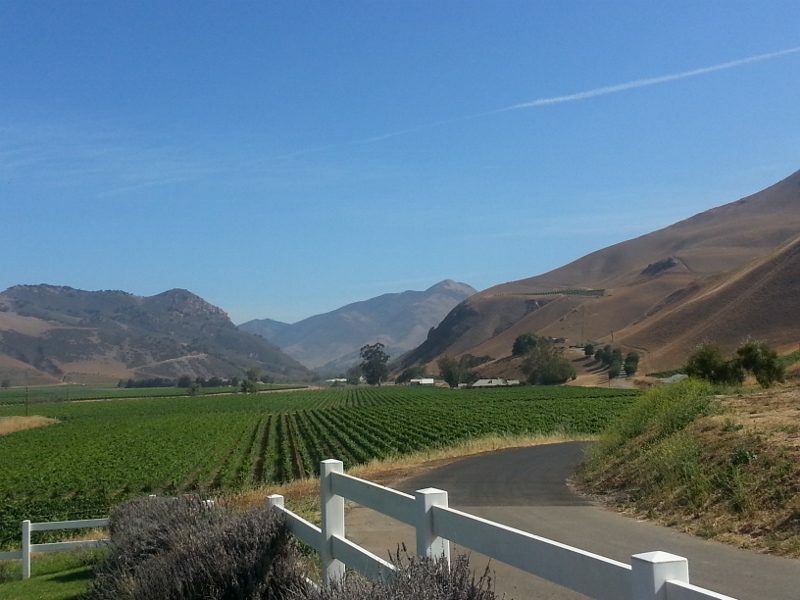 This entry was posted in Lifestyle, Wine and tagged Foodable, FoodableTV, Santa Barbara, Santa Barbara Wine Country, Santa Maria, Wine, wine country, Wine regions by Allison Levine.